Horse pasture management targets small equine operations that do not meet eligibility criteria for federal or state cost-share programs and currently may not participate in government programs. Agricultural BMPs for horse operations mainly address pasture and manure management issues. 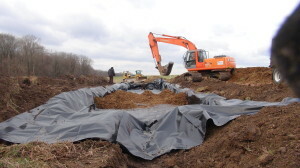 These practices may include pasture establishment or restoration, manure management and the establishment of watering troughs, stream fencing, pasture rotation systems and sacrifice lots/heavy use areas. Contact the Maryland Department of Agriculture and the local Soil Conservation District for information and assistance. Funding is currently available through the Chesapeake Bay Targeted Watersheds Grant Program awarded to the Maryland Department of Agriculture.